Dorothy Schlegel demonstrates how the new SENIORSTAT electronic system works at the Bossier Council on Aging. The software is currently used at the Bossier and Benton sites and will be implemented at the Plain Dealing site later this summer. The Bossier Council on Aging is making life a little easier for its senior members with a new computerized check-in system. Everything happening at their Bossier and Benton sites can be accessed with the swipe of a card. The SENIORSTAT program gives them the ability to touch select the various activities they want to participate in and choose if they want a meal. 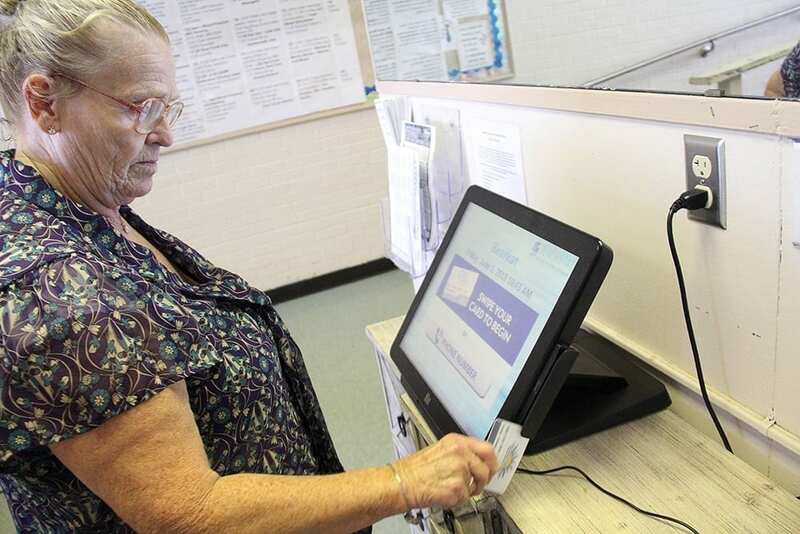 Tamara Crane, Executive Director of the Bossier Council on Aging, says the electronic system replaces the days of handwritten signatures on clipboards. Another benefit is the staff no longer has to decipher handwritten signatures or manually enter data. “This has allowed our staff to be back with the seniors for more face-to-face interaction, which is very important to us,” Crane said. The Bossier Council on Aging (BCOA) is the first agency in north Louisiana to use this system and only one of five in the entire state to have it. Funding for the program was secured through a 2016 bill by Sen. Barrow Peacock, which allocates 0.5% of the taxes collected from car rentals in Bossier Parish to go to the Bossier Council on Aging. Crane said the funding was crucial as it cost $9,000 for the initial set up with an annual fee of $4,000. “This money is coming from Bossier Parish to help our senior residents in Bossier Parish,” Crane added. The software’s company, MJM Innovations, touts its easy to use capabilities – No forms, no paperwork, no manual entry. Seniors at the Bearkat site in Bosier are singing its praises, too. Schlegel said she lost count of how many times she would sign her name every day. All it took was one person to show her how to use the system. Mary Manning said she enjoys the convenience of the computer system. The SENIORSTAT program will be implemented at the BCOA’s Plain Dealing site when it moves into the former Carrie Martin Elementary School later this summer. The Bossier Council On Aging has provided services to the seniors (over 60) of Bossier Parish since 1975. For more information on the services they provide, call (318) 741-8302. The Bossier site is located at 706 Bearkat Drive and is open Monday – Thursday 8:00 a.m. – 4:30 p.m.; and Friday 8:00 a.m. – 2:30 p.m. The Benton site is located at 202 Sibley Street and is open Monday – Thursday 9:00 a.m. – 1:00 p.m. The Plain Dealing site is located at 305 W. Palmetto and is open Open Monday – Thursday 10:00 a.m. – 1:00 p.m.